The Eleusinian Mysteries (Greek: Ἐλευσίνια Μυστήρια) were initiations held every year for the cult of Demeter and Persephone based at Eleusis in ancient Greece. They are the "most famous of the secret religious rites of ancient Greece". It is thought that their basis was an old agrarian cult which probably goes back to the Mycenean period (c. 1600 – 1100 BC) and it is believed that the cult of Demeter was established in 1500 BC. The mysteries represented the myth of the abduction of Persephone from her mother Demeter by the king of the underworld Hades, in a cycle with three phases, the "descent" (loss), the "search" and the "ascent", with the main theme the "ascent" of Persephone and the reunion with her mother. It was a major festival during the Hellenic era, and later spread to Rome. The name of the town, Eleusís, seems to be Pre-Greek and it is probably a counterpart with Elysium and the goddess Eileithyia. The rites, ceremonies, and beliefs were kept secret and consistently preserved from antiquity. The initiated believed that they would have a reward in the afterlife. There are many paintings and pieces of pottery that depict various aspects of the Mysteries. Since the Mysteries involved visions and conjuring of an afterlife, some scholars believe that the power and longevity of the Eleusinian Mysteries came from psychedelic drugs. Eleusinian Mysteries (Greek: Ἐλευσίνια Μυστήρια) was the name of the mysteries of the city Eleusis. The name of the city Eleusis is Pre-Greek, and may be related with the name of the goddess Eileithyia, but this is debated. The ancient Greek word "mystery" (μυστήριον) means "mystery or secret rite"  and is related with the verb mueō (μυέω), which means initiation into the mysteries, and the noun mustēs (μύστης), which means one initiated. The word mustikós (μυστικός) means "connected with the mysteries", or "private, secret" (as in Modern Greek). The Mysteries are related to a myth concerning Demeter, the goddess of agriculture and fertility as recounted in one of the Homeric Hymns (c. 650 BC). According to the hymn, Demeter's daughter Persephone (also referred to as Kore, "maiden") was gathering flowers with friends, when she was seized by Hades, the god of death and the underworld. He took her to his underworld kingdom. Distraught, Demeter searched high and low for her daughter. Because of her distress, and in an effort to coerce Zeus to allow the return of her daughter, she caused a terrible drought in which the people suffered and starved. This would have deprived the gods of sacrifice and worship. As a result, Zeus relented and allowed Persephone to return to her mother. According to the myth, during her search Demeter traveled long distances and had many minor adventures along the way. In one she taught the secrets of agriculture to Triptolemus. Finally, by consulting Zeus, Demeter reunites with her daughter and the earth returns to its former verdure and prosperity: the first spring. Zeus, pressed by the cries of the hungry people and by the other deities who also heard their anguish, forced Hades to return Persephone. However, it was a rule of the Fates that whoever consumed food or drink in the Underworld was doomed to spend eternity there. Before Persephone was released to Hermes, who had been sent to retrieve her, Hades tricked her into eating pomegranate seeds, (either six or four according to the telling) which forced her to return to the underworld for some months each year. She was obliged to remain with Hades for six or four months (one month per seed) and lived above ground with her mother for the rest of the year. This left a long period of time when Demeter was unhappy due to Persephone's absence, neglecting to cultivate the earth. When Persephone returned to the surface, Demeter became joyful and cared for the earth again. If we suppose that Persephone stayed with Hades for four months and Demeter eight months, corresponding to eight months of growth and abundance to be followed by four months of no productivity, we see the parallel with the Mediterranean climate of ancient Greece. The four months during which Persephone is with Hades correspond to the dry Greek summer, a period during which plants are threatened with drought. At the beginning of autumn when the seeds are planted, Persephone returns from the underworld and is reunited with her mother, and the cycle of growth begins anew. This reading of the ritual, however, does not square with the central foundation document of the mystery, the Homeric Hymn to Demeter line 415, where Persephone is explicitly said to return in the spring of the year, not the fall: "This was the day [of Persephone's return], at the very beginning of bountiful springtime." Her rebirth is symbolic of the rebirth of all plant life and the symbol of eternity of life that flows from the generations that spring from each other. The Eleusinian Mysteries are believed to be of considerable antiquity, deriving from the religious practices of the Mycenaean period and thus predating the Greek Dark Ages. One line of thought by modern scholars has been that the Mysteries were intended "to elevate man above the human sphere into the divine and to assure his redemption by making him a god and so conferring immortality upon him." Comparative study shows parallels between these Greek rituals and similar systems—some of them older—in the Near East. Such cults include the mysteries of Isis and Osiris in Egypt, the Adoniac of Syrian cults, the Persian mysteries, and the Phrygian Cabeirian mysteries. Some scholars argued that the Eleusinian cult was a continuation of a Minoan cult, probably affected by the Near East. According to Mylonas, the lesser mysteries were held "as a rule once a year in the early spring in the month of flowers, the Anthesterion," while "the Greater Mysteries were held once a year and every fourth year they were celebrated with special splendor in what was known as the penteteris." Kerenyi concurs with this assessment: "The Lesser Mysteries were held at Agrai in the month of Anthesterion, our February... The initiates were not even admitted to the epopteia [Greater Mysteries] in the same year, but only in September of the following year." This cycle continued for about two millennia. In the Homeric Hymn to Demeter, King Celeus is said to have been one of the first people to learn the secret rites and mysteries of her cult. He was also one of her original priests, along with Diocles, Eumolpos, Polyxeinus and Triptolemus, Celeus' son, who had supposedly learned agriculture from Demeter. Under Peisistratos of Athens, the Eleusinian Mysteries became pan-Hellenic, and pilgrims flocked from Greece and beyond to participate. Around 300 BC, the state took over control of the Mysteries; they were controlled by two families, the Eumolpidae and the Kerykes. This led to a vast increase in the number of initiates. The only requirements for membership were freedom from "blood guilt" , meaning never having committed murder, and not being a "barbarian" (being unable to speak Greek). Men, women and even slaves were allowed initiation. To participate in these mysteries one had to swear a vow of secrecy. Initiates, undergoing the ceremony for the first time. Others who had already participated at least once. They were eligible for the fourth category. Those who had attained épopteia (Greek: ἐποπτεία) (English: "contemplation"), who had learned the secrets of the greatest mysteries of Demeter. The outline below is only a capsule summary; much of the concrete information about the Eleusinian Mysteries was never written down. For example, only initiates knew what the kiste, a sacred chest, and the kalathos, a lidded basket, contained. Hippolytus of Rome, one of the Church Fathers writing in the early 3rd century CE, discloses in Refutation of All Heresies that "the Athenians, while initiating people into the Eleusinian rites, likewise display to those who are being admitted to the highest grade at these mysteries, the mighty, and marvellous, and most perfect secret suitable for one initiated into the highest mystic truths: an ear of grain in silence reaped." There were two Eleusinian Mysteries, the Greater and the Lesser. According to Thomas Taylor, "the dramatic shows of the Lesser Mysteries occultly signified the miseries of the soul while in subjection to the body, so those of the Greater obscurely intimated, by mystic and splendid visions, the felicity of the soul both here and hereafter, when purified from the defilements of a material nature and constantly elevated to the realities of intellectual [spiritual] vision." According to Plato, "the ultimate design of the Mysteries … was to lead us back to the principles from which we descended, … a perfect enjoyment of intellectual [spiritual] good." The Lesser Mysteries took place in the month of Anthesteria under the direction of Athens' archon basileus. In order to qualify for initiation, participants would sacrifice a piglet to Demeter and Persephone, and then ritually purify themselves in the river Illisos. Upon completion of the Lesser Mysteries, participants were deemed mystai ("initiates") worthy of witnessing the Greater Mysteries. For among the many excellent and indeed divine institutions which your Athens has brought forth and contributed to human life, none, in my opinion, is better than those mysteries. For by their means we have been brought out of our barbarous and savage mode of life and educated and refined to a state of civilization; and as the rites are called "initiations," so in very truth we have learned from them the beginnings of life, and have gained the power not only to live happily, but also to die with a better hope. The first act (14th Boedromion) of the Greater Mysteries was the bringing of the sacred objects from Eleusis to the Eleusinion, a temple at the base of the Acropolis of Athens. The Greater Mysteries took place in Boedromion, the third month of the Attic calendar, falling in late summer, and lasted ten days. On 15th Boedromion, called Agyrmos "the Gathering", the hierophants (priests or "those who show the sacred ones") declared prorrhesis, the start of the rites, and carried out the "Hither the victims" sacrifice (hiereía deúro). The "Seawards initiates" (halade mystai) began in Athens on 16th Boedromion with the celebrants washing themselves in the sea at Phaleron. On 17th Boedromion, the participants began the Epidauria, a festival for Asklepios named after his main sanctuary at Epidauros. This "festival within a festival" celebrated the hero's arrival at Athens with his daughter Hygieia, and consisted of a procession leading to the Eleusinion, during which the mystai apparently stayed at home, a great sacrifice, and an all-night feast (pannykhís). The procession to Eleusis began at Kerameikos (the Athenian cemetery) on 19th Boedromion from where the people walked to Eleusis, along what was called the "Sacred Way" (Ἱερὰ Ὁδός, Hierá Hodós), swinging branches called bacchoi. At a certain spot along the way, they shouted obscenities in commemoration of Iambe (or Baubo), an old woman who, by cracking dirty jokes, had made Demeter smile as she mourned the loss of her daughter. The procession also shouted "Íakch', O Íakche!" referring to Iacchus, possibly an epithet for Dionysus, or a separate deity, son of Persephone or Demeter. Upon reaching Eleusis, there was an all-night vigil (pannychis) according to Mylonas and Kerenyi. perhaps commemorating Demeter's search for Persephone. At some point, initiates had to down a special drink of barley and pennyroyal, called kykeon, which has led to speculation about its chemicals perhaps having psychotropic effects. Then on 20th and 21st Boedromion, the initiates entered a great hall called Telesterion; in the center stood the Anaktoron ("palace"), which only the hierophants could enter, where sacred objects were stored. Before mystai could enter the Telesterion, they would recite, "I have fasted, I have drunk the kykeon, I have taken from the kiste ("box") and after working it have put it back in the kalathos ("open basket"). It is widely supposed that the rites inside the Telesterion comprised three elements: dromena ("things done"), a dramatic reenactment of the Demeter/Persephone myth; deiknumena ("things shown"), displayed sacred objects, in which the hierophant played an essential role; and finally legomena ("things said"), commentaries that accompanied the deiknumena. Combined these three elements were known as the aporrheta ("unrepeatables"); the penalty for divulging them was death. Athenagoras of Athens, Cicero, and other ancient writers cite that it was for this crime (among others) that Diagoras was condemned to death in Athens; the tragic playwright Aeschylus was allegedly tried for revealing secrets of the Mysteries in some of his plays, but was acquitted. The ban on divulging the core ritual of the Mysteries was thus absolute, which is probably why we know almost nothing about what transpired there. Following this section of the Mysteries was the Pannychis, an all-night feast accompanied by dancing and merriment. The dances took place in the Rharian Field, rumored to be the first spot where grain grew. A bull sacrifice also took place late that night or early the next morning. That day (22nd Boedromion), the initiates honored the dead by pouring libations from special vessels. On 23rd Boedromion, the Mysteries ended and everyone returned home. In 170 AD, the Temple of Demeter was sacked by the Sarmatians but was rebuilt by Marcus Aurelius. Aurelius was then allowed to become the only lay person ever to enter the anaktoron. As Christianity gained in popularity in the 4th and 5th centuries, Eleusis's prestige began to fade. The last pagan emperor of Rome, Julian, reigned from 361 to 363 after about fifty years of Christian rule. Julian attempted to restore the Eleusinian Mysteries and was the last emperor to be initiated into them. The Roman emperor Theodosius I closed the sanctuaries by decree about 30 years later, in 392 AD. The last remnants of the Mysteries were wiped out in 396 AD, when Arian Christians under Alaric, King of the Goths, destroyed and desecrated the old sacred sites. The closing of the Eleusinian Mysteries in the 4th century is reported by Eunapius, a historian and biographer of the Greek philosophers. Eunapius had been initiated by the last legitimate Hierophant, who had been commissioned by the emperor Julian to restore the Mysteries, which had by then fallen into decay. According to Eunapius, the very last Hierophant was a usurper, "the man from Thespiae who held the rank of Father in the mysteries of Mithras." Despite the destruction of the Eleusinian Mysteries, elements of the cult survived in the Greek countryside. There, Demeter's rites and religious duties were partially transferred by peasants and shepherds onto Saint Demetrius of Thessaloniki, who gradually became the local patron of agriculture and "heir" to the pagan mother goddess. Henryk Siemiradzki. Phryne in Eleusus (1889). There are many paintings and pieces of pottery that depict various aspects of the Mysteries. 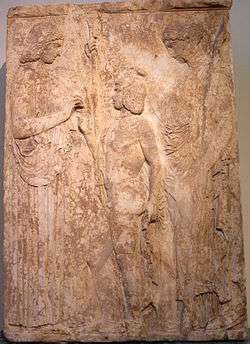 The Eleusinian Relief, from the late 5th century BC, displayed in the National Archaeological Museum of Athens is a representative example. 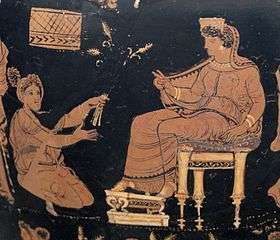 Triptolemus is depicted receiving seeds from Demeter and teaching mankind how to work the fields to grow crops, with Persephone holding her hand over his head to protect him. Vases and other works of relief sculpture, from the 4th, 5th and 6th centuries BC, depict Triptolemus holding an ear of corn, sitting on a winged throne or chariot, surrounded by Persephone and Demeter with pine torches. The monumental Protoattic amphora from the middle of the 7th century BC, with the depiction of Medusa's beheading by Perseus and the blinding of Polyphemos by Odysseus and his companions on its neck, is kept in the Archaeological Museum of Eleusis which is located inside the archaeological site of Eleusis. The Ninnion Tablet, found in the same museum, depicts Demeter, followed by Persephone and Iacchus, and then the procession of initiates. 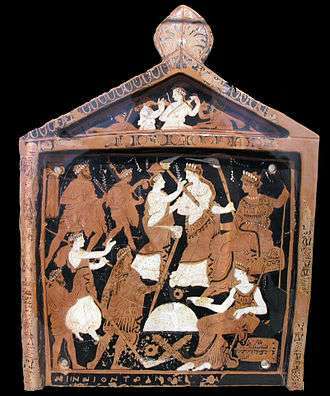 Then, Demeter is sitting on the kiste inside the Telesterion, with Persephone holding a torch and introducing the initiates. The initiates each hold a bacchoi. The second row of initiates were led by Iakchos, a priest who held torches for the ceremonies. He is standing near the omphalos while an unknown female (probably a priestess of Demeter) sat nearby on the kiste, holding a scepter and a vessel filled with kykeon. Pannychis is also represented. In Shakespeare's The Tempest, the masque that Prospero conjures to celebrate the troth-pledging of Miranda and Ferdinand echoes the Eleusinian Mysteries, although it uses the Roman names for the deities involved – Ceres, Iris, Dis and others – instead of the Greek. It is interesting that a play which is so steeped in esoteric imagery from alchemy and hermeticism should draw on the Mysteries for its central masque sequence. Carl Gustav Jung (1875-1961) borrowed terms and interpretations from the late 19th and early-20th century classical scholarship in German and French as a source of metaphors for his reframing of psychoanalytic treatment into a spiritualistic ritual of initiation and rebirth. The Eleusinian mysteries, particularly the qualities of the Kore, figured prominently in his writings. Dimitris Lyacos in the second book of the Poena Damni trilogy With the People from the Bridge, a contemporary, avant-garde play focusing on the return of the dead and the myth of the revenant combines elements from the Eleusinian mysteries as well as early Christian tradition in order to convey a view of collective salvation. The text uses the pomegranate symbol in order to hint at the residence of the dead in the underworld and their periodical return to the world of the living. Numerous scholars have proposed that the power of the Eleusinian Mysteries came from the kykeon's functioning as a psychedelic agent. Use of potions or philtres for magical or religious purposes was relatively common in Greece and the ancient world. The initiates, sensitized by their fast and prepared by preceding ceremonies (see set and setting), may have been propelled by the effects of a powerful psychoactive potion into revelatory mind states with profound spiritual and intellectual ramifications. In opposition to this idea, other pointedly skeptical scholars note the lack of any solid evidence and stress the collective rather than individual character of initiation into the Mysteries. Indirect evidence in support of the entheogenic theory is that in 415 BC Athenian aristocrat Alcibiades was condemned partly because he took part in an "Eleusinian mystery" in a private house. Many psychoactive agents have been proposed as the significant element of kykeon, though without consensus or conclusive evidence. These include the ergot, a fungal parasite of the barley or rye grain, which contains the alkaloids lysergic acid amide (LSA), a precursor to LSD, and ergonovine. However, modern attempts to prepare a kykeon using ergot-parasitized barley have yielded inconclusive results, though Alexander Shulgin and Ann Shulgin describe both ergonovine and LSA to be known to produce LSD-like effects. Psychoactive mushrooms are another candidate. Terence McKenna speculated that the mysteries were focused around a variety of Psilocybe. Other entheogenic fungi, such as Amanita muscaria, have also been suggested. A recent hypothesis suggests that the ancient Egyptians cultivated Psilocybe cubensis on barley and associated it with the deity Osiris. Another candidate for the psychoactive drug is an opioid derived from the poppy. The cult of the goddess Demeter may have brought the poppy from Crete to Eleusis; it is certain that opium was produced in Crete. Another theory is that the psychoactive agent in kykeon is DMT, which occurs in many wild plants of the Mediterranean, including Phalaris and/or Acacia. To be active orally it must be combined with a monoamine oxidase inhibitor such as Syrian Rue (Peganum harmala), which grows throughout the Mediterranean. ↑ Ouvaroff, M. (alternatively given as Sergei Semenovich Uvarov, or Sergey Uvarov, 1786–1855) (Translated from the French by J. D. Price) Essay on the Mysteries of Eleusis, London : Rodwell and Martin, 1817 (Reprint: USA: Kessinger Publishing, 2004). Ouvaroff does write that fixing the earliest foundation date to the Eleusinian Mysteries is fraught with problems. ↑ Tripolitis, Antonia. Religions of the Hellenistic-Roman Age. Wm. B. Eerdmans Publishing Company, November 2001. pp. 16–21. 1 2 Wasson, R. Gordon, Ruck, Carl, Hofmann, A., The Road to Eleusis: Unveiling the Secret of the Mysteries. Harcourt, Brace, Jovanovich, 1978. ↑ "Henry George Liddell, Robert Scott, A Greek-English Lexicon, μυστήρι-ον". tufts.edu. ↑ "Henry George Liddell, Robert Scott, A Greek-English Lexicon, μυ^έω". tufts.edu. ↑ "Henry George Liddell, Robert Scott, A Greek-English Lexicon, μύστης". tufts.edu. ↑ "Henry George Liddell, Robert Scott, A Greek-English Lexicon, μυστικός". tufts.edu. ↑ Smith, William. A New Classical Dictionary of Greek and Roman Biography, Mythology and Geography Vol. II. Kessinger Publishing, LLC 2006. ↑ The Homeric Hymns translated by Jules Cashford, Penguin Books, 2003, p. 24. ↑ Karl Kerenyi.Dionysos.Archetypal image of indestructible life.p 24,89,90. ↑ Mylonas, George E. "Eleusis and the Eleusinian Mysteries". Princeton University Press 1961, p. 239, 243. ↑ Kerenyi, Carl. Eleusis – Archetypal Image of Mother and Daughter. Bollingen Foundation 1967, p. 48. ↑ Smith, William. A Dictionary of Greek and Roman Antiquities, London, 1875. ↑ Clinton, Kevin. "The Epidauria and the Arrival of Asclepius in Athens", in Ancient Greek Cult Practice from the Epigraphical Evidence, edited by R. Hägg. Stockholm, 1994. ↑ Iacchus (Iakchos) was the divine name of the mystic Bacchus at Athens and Eleusis, derived from the boisterous festive song named for him, called Iacchus, and sung during the procession — he personified the initiates' ritual cry of joy "Íakhe". See Iacchus: Demi-God of the Ritual Cry of the Eleusinian Mysteries, Theoi Project, theoi.com. Accessed 2012-5-28. See also Aristophanes, Frogs 316 ff, 5th or 4th century BC; Plutarch, Life of Alcibiades 34. 3; Herodotus, Histories, 8. 65. 4; Arrian, Anabasis Alexandri, ii. 16; Virgil, Georgics, i. 166; and Plutarch, Themistocles, 15. ↑ According to Clement of Alexandria's Exhortaton to the Greeks. See Meyer 1999, 18. ↑ Gagné, Renaud (2009). "Mystery Inquisitors: Performance, Authority, and Sacrilege at Eleusis". Classical Antiquity. 28 (2): 211–247. doi:10.1525/CA.2009.28.2.211. ISSN 0278-6656. ↑ Filonik, Jakub (2013). "Athenian impiety trials: a reappraisal". Dike. 16: 46–51. doi:10.13130/1128-8221/4290. ISSN 1128-8221. ↑ Aristotle, Nicomachean Ethics 1111a8-10. ↑ Boardman, Griffin, and Murray. The Oxford History of the Classical World. Oxford University Press 1986. ↑ "Eleusis: Pathways to Ancient Myth". Calvin.edu. Retrieved 2012-09-15. ↑ Rassias, Vlasis. Demolish Them. (in Greek) Athens 2000. 1 2 Kloft (2010), p. 25. ↑ "Timeline of Art History: Italian Peninsula, 1000 BC – 1 AD". The Metropolitan Museum of Art. Retrieved July 26, 2007. ↑ Richard Noll. "Mysteria: Jung and the Ancient Mysteries (1994) [uncorrected page proofs of a book cancelled prior to publication due to objections by the Jung family]". academia.edu. 1 2 Wasson, et al..
↑ Robin Waterfield,Why Socrates Died, Faber & Faber, 2009, p. 92. ↑ Shulgin & Shulgin. Tihkal. Transform Press, 1997. ↑ "Erowid Ergot Vault". Erowid.org. Retrieved 2012-09-15. ↑ Stephen R. Berlant (2005). "The entheomycological origin of Egyptian crowns and the esoteric underpinnings of Egyptian religion" (PDF). J Ethnopharmacol. Journal of Ethnopharmacology. 102 (2): 275–88. doi:10.1016/j.jep.2005.07.028. PMID 16199133. Boardman, Griffin, and Murray. The Oxford History of the Classical World (Oxford University Press 1986). ISBN 978-0-19-872112-3. Cosmopoulos, Michael (2015). Bronze Age Eleusis and the Origins of the Eleusinian Mysteries. Cambridge University Press. ISBN 978-1-316-36823-7. Kerenyi, C. Eleusis – Archetypal Image of Mother and Daughter, Bollingen Foundation 1967. Kloft, Hans (2010). Mysterienkulte der Antike. Götter, Menschen, Rituale (in German). Munich: C.H. Beck. ISBN 978-3-406-44606-1. Vaughn, Steck. Demeter and Persephone. Steck Vaughn Publishing, June 1994. ISBN 978-0-8114-3362-4. Wikimedia Commons has media related to Eleusinian Mysteries.